Nothing lasts forever. The ephemeral nature of life. The transitory nature of our existence. All things must pass or more precisely in Matthew 24:6 (King James Version), all these things must come to pass. Our time on this planet is finite and I note that my vacations are very much finite as well as days off, weekends, and statutory holidays. If we look around, it is obvious that a great number of the things we take for granted do not go on forever, but do at some point come to an end one way or another. The question is just because something doesn’t last forever does that mean it isn’t good or is in some way less than good? "It may be a tragedy, but it is not necessarily a failure." I read that line over several times looking for some sort of comparison elsewhere in life and thought of somebody having gangrene in their leg. The leg is amputated and that’s a tragedy, but the patient will go on to live a long life so the operation is not a failure. Sorry, I was chuckling as I thought of the gangrene scenario because a marriage ending seems under any circumstances to be a bad thing and it strikes me as difficult to somehow put a positive spin on it. Byrne, who now holds both Irish and US citizenship, did not arrive in the United States until 1987, when he was 37. He had begun a relationship with actress Ellen Barkin, and had relocated to New York City to be with her. A year later, In 1988, Byrne married Barkin, with whom he has two children, John "Jack" Daniel (born 1989) and Romy Marion (born 1992). The couple separated amicably in 1993, and then divorced in 1999 … [They] are still close; Byrne even attended Barkin’s 2000 wedding to businessman Ronald Perelman. Barkin and Byrne are divorced but continue to have a relationship which is respectful and supportive; the two of them together seem to have successfully co-parented their children. I have to ask the question how? 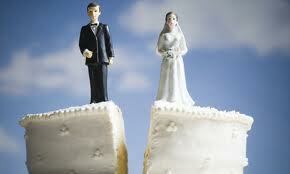 If anyone uttered the word "divorce", I’m afraid the images which would come to mind would be anything but pretty. In fact, I would be more inclined to spout off such terms as acrimonious, hateful, spiteful or even World War III. After all, Barkin’s divorce from Ron Perelman in 2006 was so labelled. Why is the Barkin-Bryne divorce working? In this blog, author Molly Monet talks frankly of her current on-going relationship with her ex-husband. My husband and I split up in 2007 after thirteen years together. We have gone from being bickering spouses to being good friends and harmonious co-parents. As I read Ms. Monet’s accounts of family activities, meals together, etc., I am a little startled by a situation which could very well be the same as Ellen Barkin’s with Gabriel Byrne. I see a peace and tranquility which exists after what I can only assume must have had its moments. After all, she does write, "I resisted my breakup to the very moment that my ex left the house, then I realized that it was for the best." Would she or her husband or Barkin or Byrne be able to explain exactly what goes wrong and why the split occurred? Would any of them be able to explain how they managed to arrive at making peace with one another so they could continue as parents together? As I see the writing on the wall, the fact that my husband and I are heading toward separation, I take particular solace any time I come across someone describing an amicable split — especially when kids are involved. … [she quotes Barkin from the NY times article] … Every marriage does have some positives, things you shared, a spark that brought you together, and in some cases, kids you created whom you hope will thrive even when your marriage could not. That is my hope as I face uncertainty and concern about how my family will reconfigure after we separate. It’s a dream of mine that my son will have both parents at his birthday parties, at his important school events, and even at holiday meals. Parents don’t need to live together to share special occasions and provide their kids with as much love as they can on special occasions. That’s an act of selflessness that I hope we both can manage. On the CNN show Piers Morgan Tonight of February 14, 2011, the host had as a guest Donny Deutsh, host of Bravo’s "Love Calling". Deutsch talks to Piers Morgan about marriage. Says Deutsch: "I was married to two great women. I think people get married at different stages of their life," said Deutsch. "Just because a marriage doesn’t last forever doesn’t mean it’s a failure." Deutsch had further advice: "Worst choice – two miserable parents staying together for the kids. That’s bad for everybody." The web site SodaHead published "Opinion: A Failed Marriage Can Still Be a ‘Success’" by Melinda Miles (Aug 18, 2010) about the end Ms. Swank’s 14 year marriage to Chad Lowe. The Oscar-award-winning actress has gone on record saying her marriage to Lowe wasn’t a "failure." In her mind, it was a "success." Swank is not the first celeb to be proud of a union that ultimately ended in divorce. Years ago, Brad Pitt told GQ he didn’t look at his 7-year marriage to Jennifer Aniston as a "failure." "Anything worth anything is a beast. The thing I don’t understand is looking at this as a failure. It’s talked about like it failed, I guess because it wasn’t flawless," said Pitt. But on the other hand, I think Swank and Pitt have an enlightened point of view on divorce. Let’s say you have 10 great years with someone — and the last five are terrible. Do the first 10 just disappear? I think the ideal marriage lasts a lifetime — but maybe there are some marriages that aren’t meant to last forever. And if you view past relationships as a learning experience and part of your human journey, then I guess Swank is right, how can your growth and maturity over a 14-year span be considered a failure? My vacation is over. Time to go home. I’m sad that it’s over. Nevertheless, I have to admit it was a good vacation. At times, I could say that it was a great vacation. Yes, it’s over, but it was good. Okay, I’m trying to be funny about something which is very, very serious. Is it a valid comparison between a vacation and a marriage? Not at all. But on the other hand, do we ever arrive at a point where we remember the good stuff but forget about the bad stuff? Or does all the rancor sit there festering away like a canker on our soul? – Hindu Prince Gautama Siddharta, the founder of Buddhism, 563-483 B.C. Ellen Rona Barkin (born April 16, 1954) is an American actress. … Barkin became a notable actress in the 1980s. Her break-out role was in Barry Levinson’s Diner (1982). … Tender Mercies (1983) with Robert Duvall … The Big Easy (1987) with Dennis Quaid and Sea of Love (1989) with Al Pacino. … Barkin has a brother, George, who was formerly the editor-in-chief of National Lampoon and High Times. Barkin is the mother of two children, Jack Daniel (born 1989) and Romy Marion (born 1992), from her first marriage to actor Gabriel Byrne. The two separated in 1993 and divorced in 1999, but are still close; Byrne even attended Barkin’s 2000 wedding to businessman Ronald Perelman. According to New York magazine, that marriage ended in a messy divorce in 2006 with Barkin receiving $40 million. In 2007, Barkin sued Perelman for $3.4 million in investment funds he allegedly promised to invest in their film production company. He was ordered to pay her $4.3 million. Donny Deutsch: "Just because a marriage doesn’t last forever doesn’t mean it’s a failure"
Tonight’s "Piers Morgan Tonight" is our Valentine’s Day edition – featuring "love guru" Donny Deutsch (host of Bravo’s new "Love Calling") … In this preview clip, Deutsch talks to Piers Morgan about marriage. Says Deutsch: "I was married to two great women. I think people get married at different stages of their life," said Deutsch. "Just because a marriage doesn’t last forever doesn’t mean it’s a failure." Deutsch had further advice: "Worst choice – two miserable parents staying together for the kids. That’s bad for everybody." Thanks for showing me that there are other couples that are also having cooperative and peaceful post-divorce relationships. My take is that divorce doesn’t have to destroy a family. That Buddha quote is a good one, isn’t it?